How to Check HDFC Policy Status? HDFC Life Insurance is one of the most reputed life insurance companies in India and offers a variety of insurance products depending on the various needs of its customers. 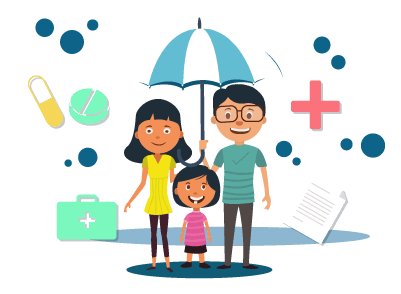 If you are interested in purchasing a life insurance policy for yourself, you can very well visit the official website of HDFC Life Insurance Company and find information on various insurance products. Just like any other major insurance company in India, HDFC Life Insurance also relies on the power of the internet to ensure that its customers do not face any problem and save time when it comes to managing their policy. Gone are the days when a person had to stand in huge queues to pay their premiums or check the status of their policy. Today, with the advent of technology and the internet, one can get all the information within seconds. We will look at how you can check the status of your policy. Log in to the official website of HDFC Life Insurance and click on the Customer Service section. Under the Customer Service section click on My Account. You will be directed to a new page, where you will have the option to use either your Client ID, email id, or mobile number along with the password to log in to the portal. Once you log in to the portal, you can then check the status of your policy. Apart from that, you can also use your Facebook, Gmail, or Twitter credentials to enter the login portal. If you are a master policyholder who takes care of a group insurance policy, you can click on Group Customers section which will direct you to a new page. You can use either your Client ID, email id, or mobile number along with the password or also through one time password (OTP) option where a secret number will be sent to the registered mobile number via which you can log in to the portal to check the status of the policy. Click on the Register tab located beside First Time User. You will be directed to a new page where you will have to enter your policy number and date of birth. Click on Submit once you are done filling the necessary details. You will receive a one time password (OTP) on either your registered email id or mobile number. Enter the OTP and click on submit. The next step will require you to create an answer to one of the secret questions from the options available. This is done for security purposes in case someone tries to enter your profile or you forget your password. Click on Submit. The next step will be creating a password for yourself. Once you are done creating the password, you can use those credentials to check the status of your policy. You can call on the number 1860 267 9999 from 10:00 a.m. to 07:00 p.m. The service is available six days a week i.e. from Monday to Saturday. Local charges may apply and you do not have to prefix any country codes. In case you wish to check the status of your policy, you can do so by sending a mail to service@HDFCLife.com. If you are an NRI, you will have to send a mail to nriservice@HDFCLife.com. You can also visit the nearest HDFC Life Insurance branch in order to check the status of your policy. Do make sure that you are carrying important documents including the policy document while visiting an HDFC Life Insurance Company branch. Hence, it is extremely easy to check the status of your policy as the online process is user-friendly in nature. You can check the status of your policy within minutes provided that you have a secured internet connection and a laptop/smartphone.